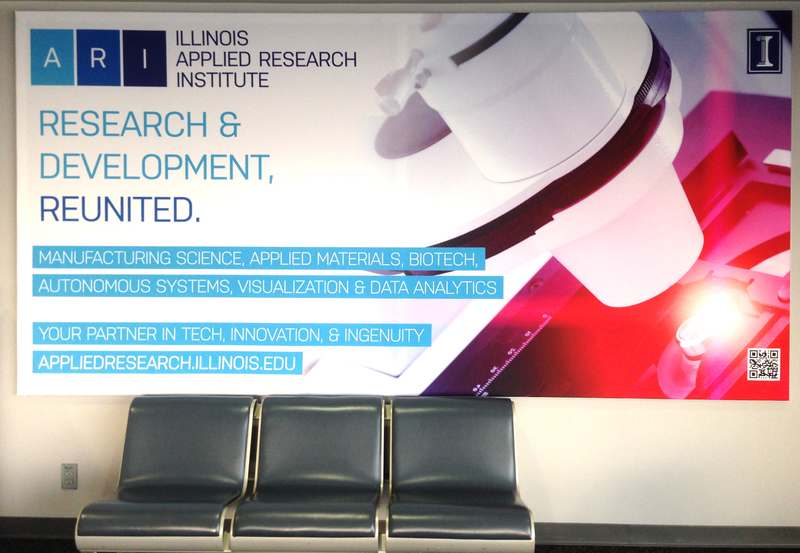 I currently work at the Illinois Applied Research Institute as a Communications Specialist. The ARI is a joint initiative of the University of Illinois at Urbana-Champaign’s College of Engineering and Vice Chancellor for Research to grow applied research partnerships with the University and commercial and National Lab partners. 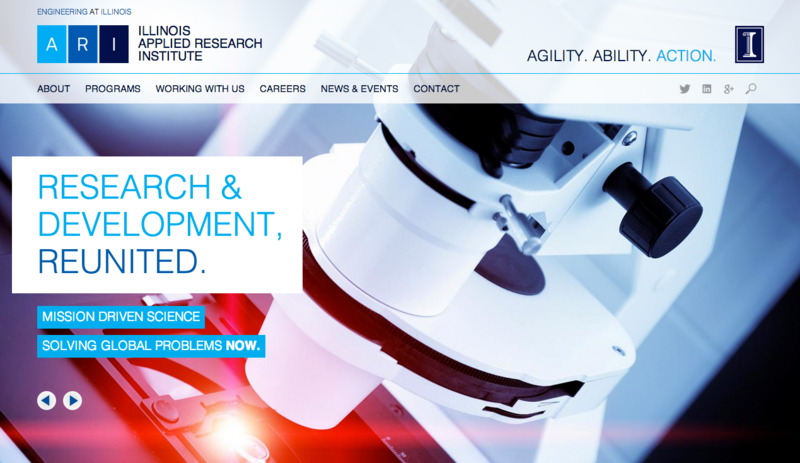 The ARI conducts translational research and develops products and new processes for the marketplace. In January 2014, I kicked-off a comprehensive branding and website redesign project for the ARI. This project was to develop a platform for the ARI that would allow the organization to grow from a small University of Illinois unit to a planned multi-million-dollar-a-year organization with dozens of staff within only a few short years. To accomplish these goals, the ARI would need to project a professionally-oriented image that emphasized its connection to the University and its technical capabilities. As part of the planning process, I performed background research on competing organizations and their web and branding efforts, developed a list of website communications best practices for the ARI, and rolled those concepts into the general communications platform that I was developing for the organization. This living document, which has also incorporated feedback from University communications leadership, is informing my current work and helps determine the actions that I take on a daily basis. To do the heavy lifting (coding, graphic design, and some branding) for the website and accompanying print materials, I selected a local vendor. I worked closely with this vendor and the ARI executive leadership to translate the organization’s mission into a complete visual identity and website, using content that I produced. The new ARI homepage featuring a rotating header and responsive design. The new website launched in June 2014, five months after project kickoff. See the website here. Below is a sampling of advertisements that I have created to promote the ARI to various disparate audiences including university leadership and corporate executives, alums, and STEM-oriented students. All ads reflect the ARI brand and prioritize its technical and business-development capabilities. Additionally, I have been working with the College of Engineering’s Office of Corporate Engagement to develop new collateral material including brochures and an online toolkit for its business development efforts. This far-reaching project has required the creation of original content, gathering and editing information from other campus units such as the Office of Technology Management and Sponsored Projects, and prioritizing and editing feedback. I have been the primary point-of-contact on this project.